base is about 90 miles from Las Vegas and has been shrouded with mystery and controversy for decades. Season 2, Episode 2 of Conspiracy Theory with Jesse Ventura saw the former pro wrestler go to the border of this venue. This program is only going to fuel more speculations as to what the government is doing there. At a truck stop, the former governor met up with Chuck Clark, an amateur astronomer. 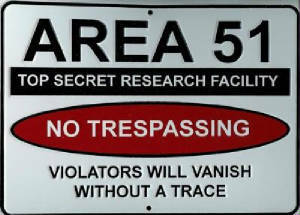 Clark claims he researched the area outside of Area 51, digging up warning sensors. Then his house was raided by the Joint Terrorism Task Force and FBI in Rachel, Nevada (the closet town to the base). He said a lot of mysterious burnings were going on and that people are being killed in experiments out there, drawing conclusions from some Freedom of Information documents. Investigator Daniel talked to Clifford Clift of the Mutual UFO Network, who says around a dozen space ships are on site there, where the workers there study the "back engineering" capabilities of such aircraft. Michael Schratt, an aerospace engineer, says that ultra-advanced "Deep Black" programs are being developed on the base, including bizarre-looking aircraft that looks like something extraterrestrials would use. The public's fascination with space aliens is perfect cover for the alleged doings there, according to Schratt.